Inlays and onlays are a type of filling constructed outside of the mouth (usually by a laboratory) and cemented onto the tooth. They are usually stronger than normal fillings and are often used to provide an aesthetic alternative to metal fillings or crowns. 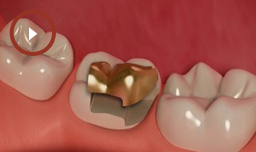 If you have very large amalgams that you wish to replace, then your dentist may recommend having an inlay or onlay. 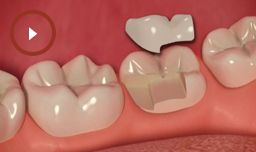 What are the different materials used for inlays & onlays? Appointment 1: We numb your tooth and remove any decay. Next, we prepare the cavity to receive the inlay, before taking an impression of it. This is used by our lab to custom-make your new inlay (or onlay). 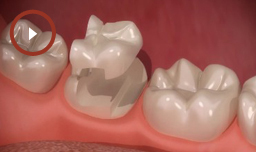 Before you go, we also place a temporary restoration on the tooth.